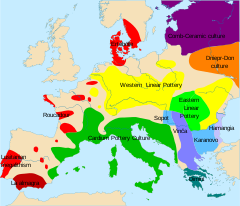 Map of European Neolithic cultures. Bug–Dniester culture is right yellow color spot. Over approximately 1,000 years, 6300–5500 BC, the Bug–Dniester culture metamorphosed through different cultural phases, but the population remained about the same. What is most noteworthy about the Neolithic in this region is that it developed autochthonously from the Mesolithic there. The people in this region relied predominantly on hunting aurochs, red deer, roe deer and boar, and fishing for roach, eels and pike. They made pottery from about 6200 BC. This type of pottery made by hunter-gatherers had arrived in the middle Volga from the Lake Baikal region of Asia. One notable characteristic is that many pots had pointed bottoms, designed for cooking over a fire. They could be decorated in patterns of wavy lines. This local culture was influenced by the neighboring Neolithic Criş culture, whose origins lay in the Carpathian basin. The Criş farmers arrived in the upper valleys of the Seret and Prut about 5800–5700 BC. Criş pottery forms were copied by the Bug–Dniester people. Wild grasses were abandoned in favor of einkorn, emmer and spelt. Cattle-breeding was adopted. ^ David Anthony, The Horse, the Wheel and Language (2007), pp. 147–149 and fig. 8.5. ^ David Anthony, The Horse the Wheel and Language (2007), pp. 140, 147–151.